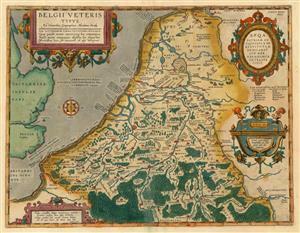 Important early historical map of Belgium and the Netherlands showing the region as it was known to the Romans. Ortelius, an enthusiastic historian, studied ancient sources, including the writings of Julius Caeser, to compose this map. Settlements are labeled by their ancient names. The description in Latin on the verso discusses the history of the Roman conquest and the character of the Celtic tribes inhabiting the region, such as the Belgii.